I guessed these might arrive today based on when I received notice that they had shipped. 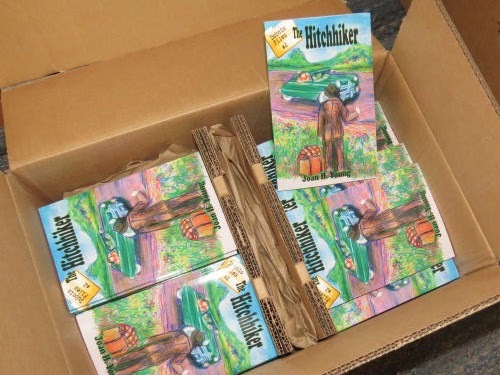 100 copies of The Hitchhiker have joined those of The Secret Cellar. The spines look really nice side by side. I'll wait till I have all three to show that. But those won't be here tomorrow. There was a time lag while I got the formatting done on the third one. Today I got Library of Congress Catalog Numbers assigned to the books. They won't be in this first printing, but that's ok. It's pretty easy to tweak files on CreateSpace.